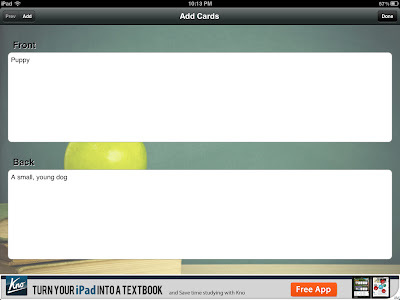 TAPA Room 210: Digital flashcards on-the-go! Now there's no excuse to skip studying! 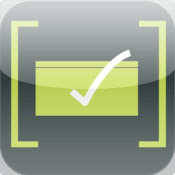 Digital flashcards on-the-go! Now there's no excuse to skip studying! Growing up, I remember using flashcards to help me memorize things for school: equations, state capitols, definitions, any. Using notecards is a little bit outdated now, but with a cool app I've been playing around with recently, it's again available, but now on the iPad! One tap will show the other side. Sliding the card across will proceed to the next slide. Double tapping will return to the last slide. 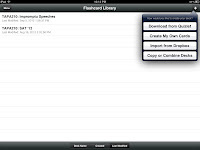 The app works in both landscape and portait modes, and, as an added feature, this is a app, meaning that it will work for both iPad, iPod Touch, and iPhone, so there's more bang for the buck. Title your deck in some way you'll remember it. 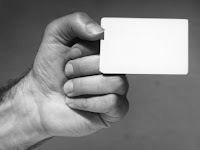 Repeat the Add Cards step over and over until you have everything the way you want it. On completion, you may hit Done again. That's basically it. Now, from here you can Share the stack with others via email or by Dropbox, which is very convenient for study buddies or classes. It's a simple process, but time-consuming. 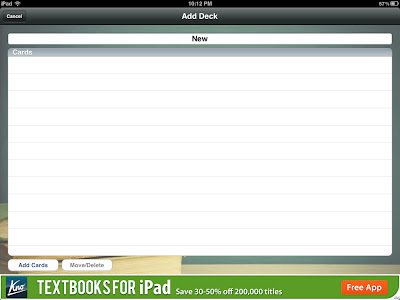 A superior option would be using Quizlet, a free website that makes flashcards online. 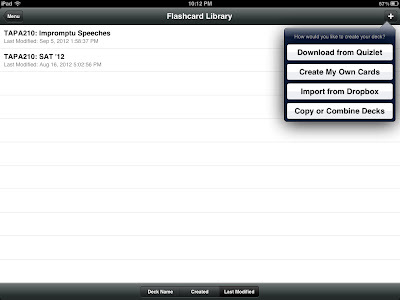 Flashcard* will actually all you to import any flashcards you make on Quizlet, and it's MUCH faster to do online with a real computer. 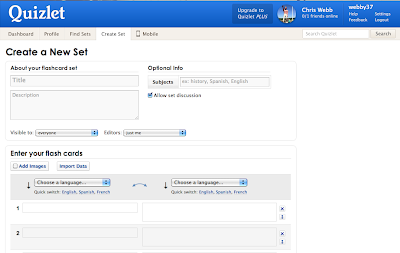 To make this happen, you simply go to Quizlet.com, create an account, and then click Create Set. 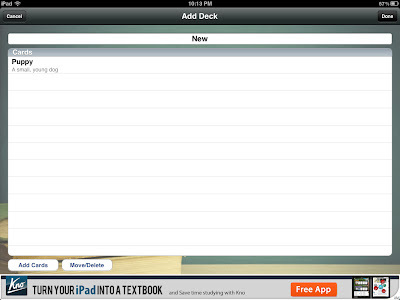 As you can see, Quizlet allows you to easily make your own cards with whatever text (or images, apparently) you want. It will even auto-define words for you, in whatever language you please! A new set, ready to be personalized. My favorite feature, though, is under Import Data; you can simply paste in a list of vocabulary words, separated from their definition by a tab, a semicolon, or whatever symbol you already use. I have a list of SAT words my English II students memorize that I copy-and-pasted into this section; within 15 seconds, I had 170 vocabulary notecards, ready to go. I put a title on it my students (and myself) can easily find, and now, every student has 170 flashcards so they can review for their next test, any time or any place! 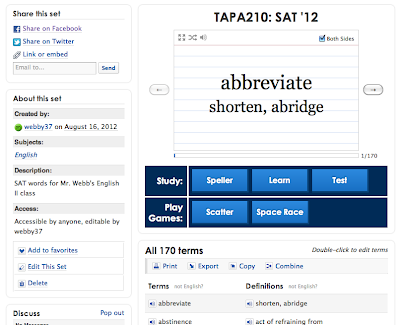 Click here for my SAT words! It's such a simple process, and one you can easily pass on to your students. Give these two cool tools a try, and let me know how they go!